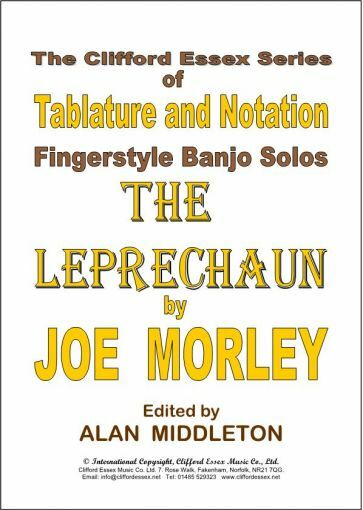 Location: /Sheet music/Fingerstyle Banjo/THE LEPRECHAUN BY JOE MORLEY. Morley uses a fairly common format of short Introduction, three sections, a bridge passage and a Coda. The piece starts with a catchy tune in G major and then moves to the relative key of E minor. 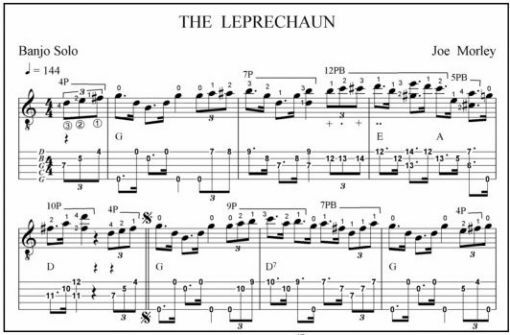 The third section is in C major, where grace notes imitate the ‘tap, tap’ of the leprechaun’s hammer, and this is followed by a typical Morley bridge passage. After various repeats, a short Coda completes this very attractive solo, which certainly has an Irish flavour to it.